Finding free disk imaging tools is the best way to protect data security of your hard drive. 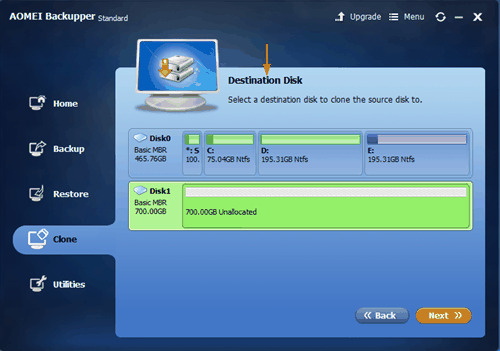 AOMEI Backupper is the best suitable software to create disk image. Disk images are computer files containing the contents and structure of a disk volume or an entire data storage device. A disk image is usually made by creating a sector-by-sector copy of the source medium, thereby perfectly replicating the structure and contents of a storage device independent of the file system. Why need create a disk image? •Some backup software only backup user files. Boot information and files by the operating system, such as those in use at the time of the backup, may not be saved on some operating systems. But a disk image contains all files, faithfully replicating all data. •Large enterprises often need to buy or replace new computer systems in larger numbers. Installing operating system and application into each of them one by one requires a lot of time and energy and has a significant possibility of human error. Therefore, system administrators use disk image to quickly clone the fully prepared software environment of a reference system. This method save times and energy and allows administrators to focus on unique distinctions the each system must bear. So create a disk image is essential. 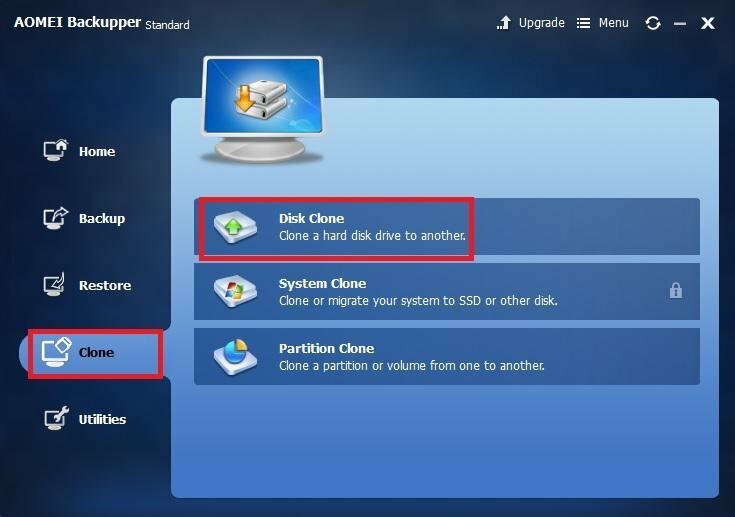 The intention of creating a disk image is to clone all your data on your hard drive. The success rate of anything depends on the tools you use. So how to choose a free disk imaging tool for your hard drive imaging? Firstly, the disk imaging tool could create a disk image which is all-inclusive in a high efficiency. Secondly, it should have an intellectual interface so that it can be easily acquainted by a new user. Besides, free disk imaging tools which meets the demands above are more popular among customers. AOMEI Backupper is a disk imaging software which satisfies all the condition mentioned above. It can create a disk image in a time saving and energy saving way. And it is easy to use for new comer of a disk imaging software. What’s more, you do not need to pay for it. Therefore AOMEI Backupper is the best choice when you choosing free disk imaging tools. Now let me show you how to use AOMEI Backupper as a free disk imaging tool. We take creating a disk image of your computer hard drive to external hard drive as the example. Step1. Download AOMEI Backupper, install it. Plug the external hard drive into computer using an available USB port. Launch AOMEI Backupper, then select Disk Clone under the Clone option. Step2. Select the disk that you wish to clone. Here is Disk 0,then click Next. Step3. Select the destination disk to clone the source disk to. Here is Disk 1, click Next. Step4. Click Start Clone to begin the perform. Click Finish until the clone is done. ● Plug the external hard drive into computer before you launch AOMEI Backupper, or you need to refresh or restart the software. ● Do not extract the external hard drive before all the clone is done. 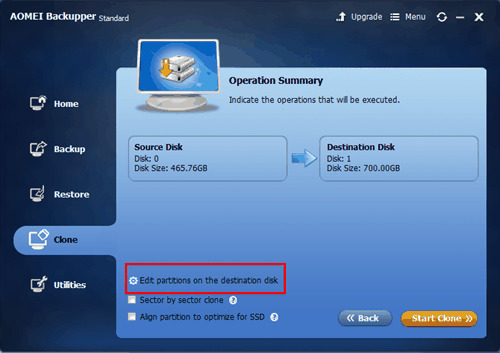 ● In the Operation Summary interface, if you need to adjust your external hard drive’s partition size and location, select “Edit partition on the destination disk”. “Sector by sector clone” is optional to copy all sectors of the disk to the destination disk whether in use or not, but the destination disk size must be equal to or larger than the source disk. “Align partition to optimize for SSD” is highly recommend, for you can tick this option to optimize the performance of the SSD.